2. Boredom – If you haven’t been a typical online reader and actually read something before you got to these bullet points, you would have realized that I used it for this post. The past 6 days I’ve been a little pre-occupied with boredom so when I got this in the mail I was stoked. It only took about 2 days to get here with standard-free-ground shipping. Made my day. I wrote at least 2000 words in the Action Book within the first 3-4 hours of ripping the plastic off of it. 3. Old-school note taking of any kind – Business meetings these are big for—but I’m surely not at that stage, and don’t really plan to be—so I’m not really familiar with that one, but I definitely get the picture. High school kids would love this if they’re productive at all, or want to be. When I go to college in my hopefully-near-future I’m going to buy another one of these bad boys. I probably won’t ever fill it up (I’m not that creative) but you get the idea. 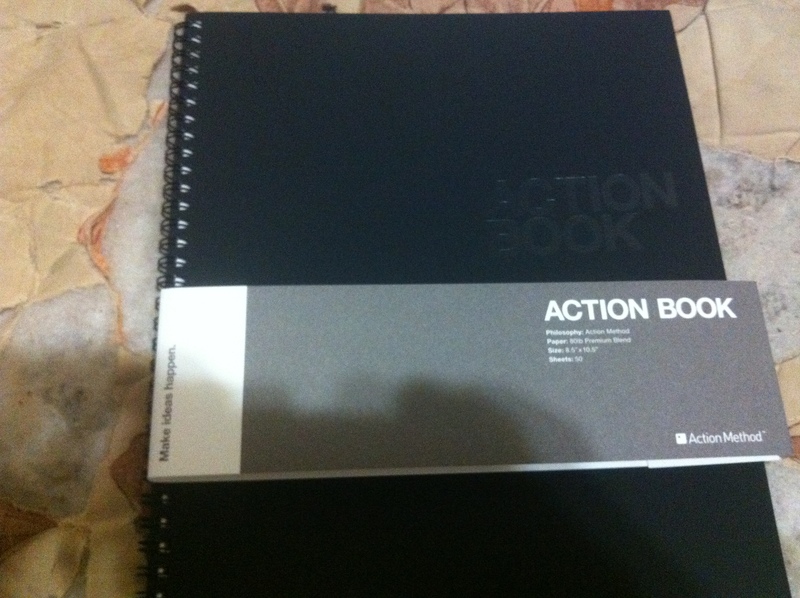 What the “Action Book” is based on, is Behance’s “Action Method.” It’s technically just the name of their “Suite” of a variety of different notepads and stationary. 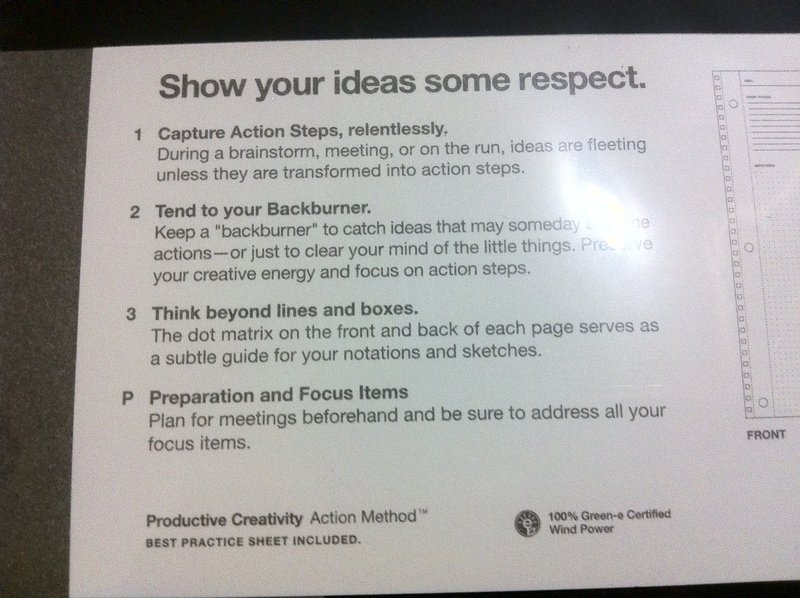 The Suite includes the Action Method template on each sheet. It’s simple. Starts with a title area and a date slot at the top. 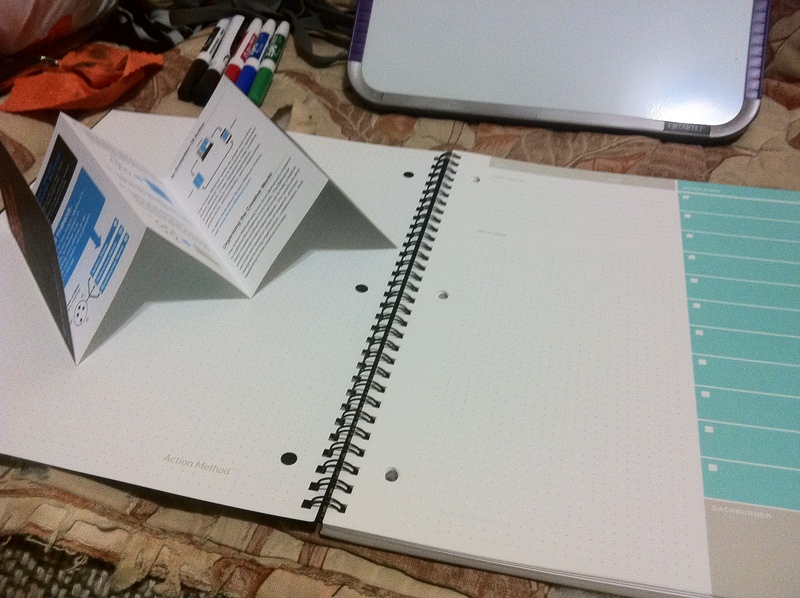 Below that is their slick “Dot-Grid” instead of college or wide ruled lines on a page or a clean sheet. The Dot-Grid is amazing for sketches, and It’s really not bad for writing a ton. Along the right side of the page, there are the “Action Steps.” These are crucial little spaces (including checkboxes for obvious reasons) for your steps, and a little room to elaborate. Below the Action Steps at the bottom is what’s called the “Backburner.” Personally, I use this very small space to simply jot down small clues for myself when I’d like to reference them later in the Dot-Grid. Lasting thoughts, if you will. I’ve taken a couple of photos here for you all to check out from my unboxing affair. Online: They also have a newly added Online Action Method. They now have an online service which you can now connect to via their iPad, iPhone, and Android mobile applications. Overall: I love this thing. The Action Book full notebook is worth it above the rest; others are practically just add-ons for your workflow. They could really work as a workflow though, using the smaller pad to reference and take notes, while elaborating using the full size book. I advice everyone to grab one. Drop $15 and be more productive in your downtime; especially if you’re lacking a laptop. Readers: Have you used any of Behance’s products? What about their new online suite? It’s gone mobile, so get to it! I’ve been using their materials from Levenger for awhile and just started trying the online version, too. It’s amazingly simply and yet elegant. Seems to be working for many of us. Thanks for the post. I actually haven’t used the online version. The book is enough for me at the moment, but I hope to check it out sometime soon. and will be fully eliminated the moment you obtain the ultimate track. which will be helpful in saving your time and money. These sites provide a great deal on the beats for the independent musicians.